Oleo has for a long time been GNU's spreadsheet. Now there's not only Oleo but also Gnumeric, the GNOME spreadsheet. Gnumeric is a full featured spreadsheet, aiming to compete with commercial applications, and well integrated with GNOME. Oleo is a light-weight spreadsheet that'll work in almost any environment. Oleo features a curses based interface (character mode), and also a LessTif (Motif) based graphical user interface. 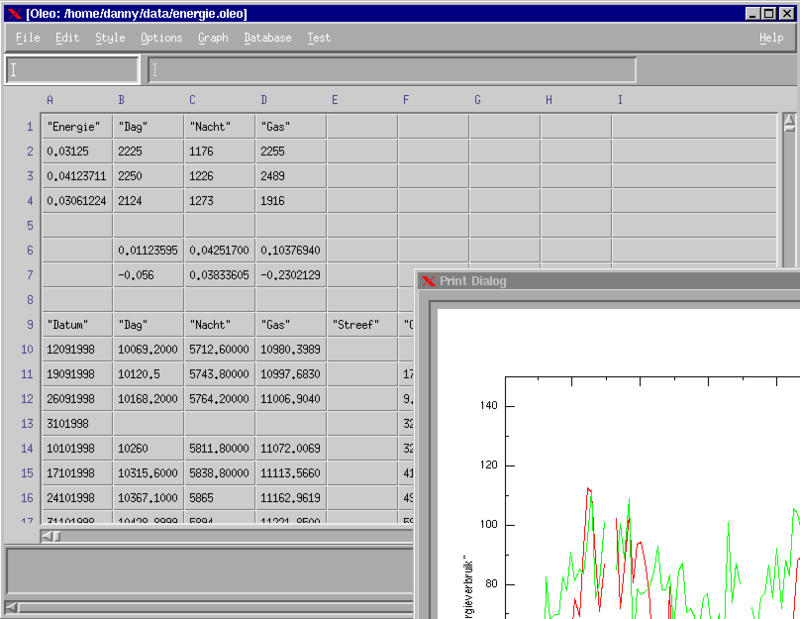 A screenshot of the Motif GUI is here (11K png file). The current development release of oleo is 1.99.16. Oleo can be found on the main GNU ftp server: http://ftp.gnu.org/gnu/oleo/ (via HTTP) and ftp://ftp.gnu.org/gnu/oleo/ (via FTP). It can also be found on the GNU mirrors; please use a mirror if possible. Access to the statistics functions of the GSL (GNU Scientific Library). Support for opening multiple spreadsheets, each in a Motif window, at the same time. Details about recent changes are available in the ChangeLog file. There is a manually updated version of ChangeLog here, you can get the latest version from CVSWEB using a URL like http://subversions.gnu.org/cgi-bin/cvsweb/~checkout~/oleo/ChangeLog?rev=1.150 but then you need to know the latest version number (1.150 at the time I write this). The Oleo documentation is now also available online. Intermediate versions are available through anonymous CVS, and their source can be browsed online through the cvs-web interface. The complete sources to Oleo are in the GNU CVS server at subversions.gnu.org. You can read more about this on http://www.gnu.org/software/devel.html. subscribe to bug-oleo (be sure to put the word subscribe in your subject line). The GNU mailing lists maintain archives of the messages sent to it. The archives can be queried by E-mails whose subject starts with the word archive. By sending a message with subject archive help to bug-oleo-request@gnu.org you will ask the server to send you a message with instructions for working with the archive server. We recommend that you also send a message with the subject archive ls latest as "latest" is the name of a directory. Our TODO and ChangeLog files are now web-accessible : TODO , ChangeLog . Please note that LessTif is a freely available replacement for OSF/Motif. LessTif is licensed by the GNU LGPL and can be obtained from www.lesstif.org. Development of Oleo, and GNU in general, is a volunteer effort, and you can contribute. For information, please read How to help GNU. If you'd like to get involved, it's a good idea to join the discussion mailing list (see above). For development sources, bug and patch trackers, and other information, please see the Oleo project page at savannah.gnu.org. Oleo is currently being maintained by Delyan Raychev (delqn.com). Please use the mailing lists for contact. Oleo is free software; you can redistribute it and/or modify it under the terms of the GNU General Public License as published by the Free Software Foundation; either version 3 of the License, or (at your option) any later version. Please send general FSF & GNU inquiries to <gnu@gnu.org>. There are also other ways to contact the FSF. Broken links and other corrections or suggestions can be sent to <bug-oleo@gnu.org>.